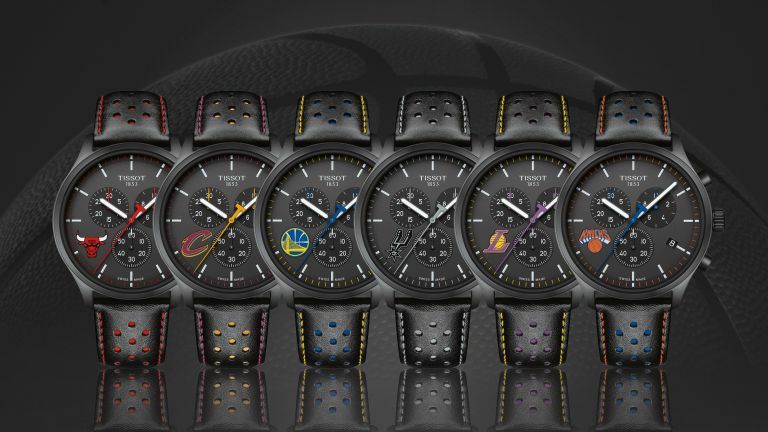 The NBA is coming to London on 11th of January, and to celebrate Tissot, official timing partner of the NBA, has launched a new collection of watches. Based on the standard Tissot Chrono XL, the NBA Special Edition features a few neat design changes. The most prominent of which is the dial, which now features the logos from the top teams in the league. These teams include the Chicago Bulls, LA Lakers, New York Knicks, San Antonio Spurs, Cleveland Cavaliers and current champions Golden State Warriors. The black indices and black dial accentuate the team logos. The large 45mm black PVD cases make a statement, and the stitching on the strap is matched to the team logo. Inside the case is a Swiss Made Quartz Chronograph movement, and you'll find a NBA logo engraved on the caseback. The watches are available for purchase from November, priced at £265 (around $265 USD). The NBA Global Games will come to London on the 11th of January, where this year you'll be able to watch Boston Celtics vs Philly 76ers.